I purchased your plans some time ago but got side tracked with other projects. Hope to get a start this winter. 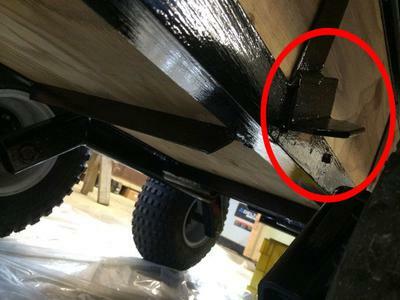 Curious as to what you think would be the minimum wheel clearance (top of the wheel to bottom of the box when level)for a trailer that isn't going to see extreme conditions? I have seen pictures of some builds that have flat decks over the wheels but there must be some sort of stop incorporated in the wheel arch to prevent the higher wheel from jamming against the box bottom. Any thoughts on this? I think you would want about 4-6 inches clearance to allow the tires to clear and arch to do its job over uneven objects. As for tires rubbing under any over hang, just add a short piece of angle iron to match up with the arch to create a stopper. I have seen where guys have't even bothered and let the tire rub, but to me that just adds more friction and tire wear. I doesn't take much to do it right the first time.